This sister's name is Etana. She & her management were kind enough to send me a few of her songs and all I can say is WOW. She will be a force to be reckoned with. Her spirit reminds me of India Arie, but her music & voice are MUCH bigger (and she has the gift of the reggae rhythm). This video is for her heart-wrenching song entitled "Wrong Address" which deals with the classist attitudes that exist in Jamaica. It's pretty sad. We all know that the best reggae music comes from the poorest set of people because they put their HEARTS & SOUL into it. 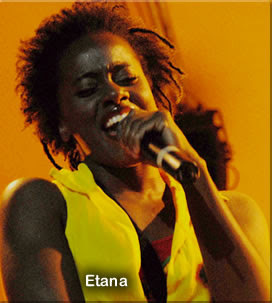 Etana is the personification of heart & soul. I just hope that the shady business of music doesn't send her into a tailspin (L-Boogie). When her CD drops, it will be in regular rotation in my car, house & MP3 player. Etana, you're a STRONG one sis! Keep it up! Be sure to visit my podcast to hear some rare & crucial reggae music. It features Tanya Stephens live in concert, Bitty McLean, Gregory Isaacs and much more! !